Did you know that one of the things that I like about being an Environmental Officer is that I never stop learning new things? I always get excited whenever I discover something interesting about a certain plant, animal, rock, fungus, and even bacterium. It’s also fun to share those bits of trivia with the guests and my fellow staff. Every morning during the supervisors’ briefing, I give them a daily dose of trivia just to lighten up the mood for the busy day ahead of us. They’re all ears the second I begin my “Did you know…?” announcement! I enjoy seeing their faces light up whenever they’re amazed by a new discovery. I must have the same look every time I learn something new. They’re mostly tickled by the peculiar courtship and mating rituals of animals. Whenever I run out of things to share, I take time to research on the internet too. Cascades of information with just a click – hooray for technology! Aside from welcoming the New Year with a bang, we also welcomed it via a new activity: a nature tour. Guess who the guide is? My ultimate goal is to instill an appreciation for the beauty of nature. That through the stories I share, our guests come to realize how lucky we are to be in a place as beautiful as this. The nature tour is a short walking tour along the pathway in front of the resort, with me pointing out some of the plants with interesting “Did you know…?” stories. Bonuses come in the form of a huge monitor lizard, a playful squirrel, or even an elusive mouse deer. Surprise appearances by these critters definitely get the guests even more excited. 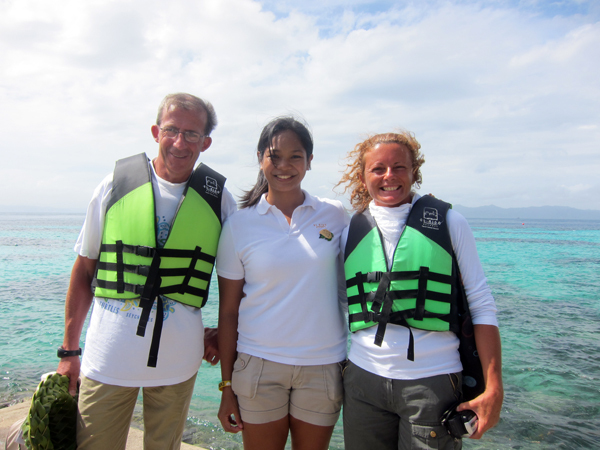 I want to learn more about the wildlife of Apulit Island and its surrounding waters. There’s so much to explore around here! I dream of experiencing all of the amazing and wonderful things nature has to offer. The world is full of adventures just waiting to be had, and what better way to start than by being in Apulit Island Resort? Read all articles by Mavic Doctor.